Thursday 17th March 2016 was a cracking spring day, with egg-stravagant activities held at King’s Oak Primary School in South London. UCL IEDE Researchers (Emily Nix, Valentina Marincioni, Virginia Gori, Yekatherina Bobrova and Dr Hector Altamirano-Medina) held workshops with Years 4, 5 and 6 as part of British Science Week. The workshops were developed to engage the pupils in issues researchers, or Building Scientists, at UCL IEDE deal with every day, with a particular focus on winter building performance and the role of insulation materials in achieving healthy low-energy spaces in which to live. In total six 90-minute sessions were held, with two parallel sessions at a time for each year group. During the sessions, the pupils were challenged to become eggs-perts in Building Science and had to design, build and insulate an egg-house for Mr Egg who kept getting cold in his home. First, an introduction was given with a discussion on methods the pupils used to keep warm during winter. They quickly understood that the methods could be categorised into two practices: adding heat (e.g. sitting next to a fire) or saving heat (e.g. putting on a jumper), and that saving heat is better when considering energy use and cost. 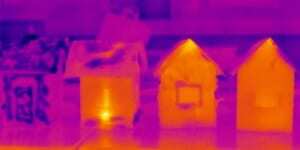 The practice of saving heat through the use of multiple layers and the performance of materials were illustrated through infrared images taken with a thermal camera. Parallels were drawn between how a person keeps warm and how a house keeps warm (adding heat: through heating, and saving heat: through insulation, draught proofing) leading to the understanding that, similarly, saving heat is better as it reduces energy consumption and helps to achieve a sustainable planet. With these concepts, the pupils’ task was to build and insulate a cardboard house, where a freshly boiled egg (aka Mr Egg) would be placed. The thermal camera would be then used to assess how well the house trapped the heat. Given instructions that the house must have a door and windows, the pupils worked in small groups and hatched a plan to insulate their egg-houses. Armed with felt, bubble wrap, glue, scissors, card, cellophane, tape and a base-structure the pupils had 30 minutes to complete the task. A variety of egg-ceptional ideas were seen: from carpet, to curtains in both bubble wrap and felt, to total-insulation using a bubble-wrapping technique, to double glazing and even an additional porch. The UCL IEDE session leaders were shell-shocked with the outcomes achieved during the short-time period. At the end of session, the egg-houses were tested using the thermal camera and each group had the opportunity to assess their designs, allowing understanding where the insulation performed well and if any gaps were left. A final wrap-up was completed and stickers were awarded to the pupils for their hard work. Infrared image of the egg-houses (blue is cool, yellow hot). Can you spot the egg inside? Which house is best? The response from the pupils and teachers was positive, with one group indicating that “this was the best activity during the whole of the Science Week so-far” and one Year 6 class indicating that they had “egg-cellent fun”. All in all, it was egg-cellent day with some brilliant work by the pupils at King’s Oak. Hopefully, the pupils are able to take something away from the day, beyond the egg-house, and now are able to consider the methods they use at home to keep warm and can help achieve healthy low-energy spaces in the future. By the end of the day the researchers were eggs-hausted and definitely looking forward to a relaxing Fry-day back in the UCL IEDE office!